When a United States President reaches for the red phone, the reason behind the message MUST be worthy of such a communication. 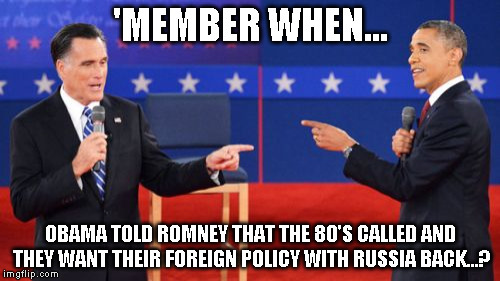 Obama used the red phone to contact Vladimir Putin to demand Russia stop inserting itself into the 2016 presidential race which they didnt do! Apparently, unsupported claims of hacking into the Democrat Party emails was enough for Obama to call Putin on the emergency line which has always been reserved for far more important things, like discussions of acts of war. At least one of Obamas senior advisers urged him to pick up the red phone and call Vladimir Putin, NBC News reports. Obama allegedly did not want to further inflame Russia so he used calming and less specific language when warning Putin about the consequences he would levy if the hacking and interference did not stop. The red phone was part of the Cold War communication system with Russia. It directly connects Washington, D.C. with Moscow. Obama could have used a regular Oval Office land line to call Putin, but he was apparently trying to make a statement when opting instead for the emergency line. During the conversation Barack Obama reportedly even used the phrase, armed conflict when warning Vladimir Putin to stop hacking emails of Democrat elites and members of Hillary Clintons senior campaign staff. During the G20 Summit in September, Obama also reportedly warned the Russian leader to steer clear of the 2016 presidential election. The red phone system was created to communicate between the two nations during a moment of crisis, such as the September 11, terror attacks. It is not a real phone but instead began as a teletype more than five decades ago. It has since been converted into a fax machine and now an email transmitter link through the two nations Nuclear Risk Reduction Centers. Obamas administration added a specific line that is intended to deal with cyber threats, which is the line Obama used for this communication. The releases of the hacked Democrat Party emails continued after this. Either Russia was not behind it, or Putin simply didnt find Obama all that intimidating. Its a dramatic step to pick that phone up and use it, Retired Admiral James Stavridis, the former head of NATO, said. Obama has never used the red phone system to contact Vladimir Putin before. Whining chants of Russia hacked our election are vastly misleading the uninformed members of the American public. When asked about exactly what Russia did, the vast majority of Liberals and their millennial snowflake offspring cant respond with any specifics, just that the Russians hacked our election. In reality, the DNC and Podestas email were leaked. The phrase now commonly used by Liberal political elites and their cohorts in the mainstream media who make it sound as if Putins KGB goons pilfered with election results, committed voter fraud, or secreted away cast ballots. All the leakers, whomever they were, did to impact the election was to reveal the nasty insults and bias at play inside the Democrat Party and the Clinton campaign. Obama and Hitlery are trying to start a war with Russia asap and my guess is to impose martial law to change the election results and/or to cripple President Trump . Today, Obama the evil one began to throw out Russian diplomats from America as he deceives the leftist voters as the election threw his policies out and he is looking for a scapegoat. The monster is raging against us, may Jesus Christ save America from the evil left and their many inventnions. Remember that it was wikileaks that exposed them and how Debbie Shultz fixed the primaries for Hitlery. Now they are scapegoating Russia. And don't forget that a young democrat Sanders supporter was shot on his way home from the DNC and how Assange grieved for him. The left are monsters and fools, evil and deceived, arrogant and ignorant and so very dangerous to America. IMHO, he is dangerously deranged and per 25th Amendment should be found mentally unfig to govern. He couldnt do what I did and send a dozen pizzas with everything to the kremlin? He will do something nefarious very soon.. I wouldn’t sweat it. Obama should have tried this crap sooner, before the Electors voted. At this point, the Secret Service or Military will simply help him out the door if he tries to get too cute. The election is over. Like calling 911 to report that a car drove by. Except that in this case homobama is flirting with instigating WWIII. What an idiot! Didn’t this happen weeks ago? What, did you just sober up for a month-long bender or something? Its the old story. How do you make a conservative mad? Tell a lie. How do you make a liberal mad? Tell the truth. Lock this guy up, just for being such a dumb sh*t.
America has had an illegitimate government for eight years. It is rising in a crescendo to its ultimate end. No, he is worse than that, he is criminally insane, I believe. obama’s afraid of his own shadow. He wants to get out, get richer, play golf and be worshiped. We’re not going to war with Russia in the next 22 days. Putin is no fool. He won’t fall for any of the nonsense this regime tries to instigate him. John Podesta and the DNC are not our government and this sounds like much political insanity over nothing.